Store Supply Warehouse knows that customer service is the cornerstone to operating a successful business. The Metal Framed Service Counter with Maple finish is a multifunctional counter that provides retailers with the capabilities to quickly and efficiently service customers, while also adding a sleek, modern look to any display presentation. Our case features functional multi-purpose design with adjustable rear storage shelves and bins that can be used to house smaller supplies, tools, or bags. The 34" high counter top surface complies with ADA guidelines. Additional features include a fully finished sturdy 3/4" top, sides, shelves, a front lower panel with a maple melamine laminate finish and a recessed black kick-plate, and anodized aluminum frame all around. 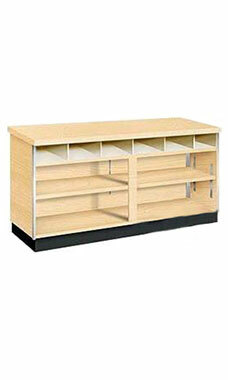 Overall measurements include 34"H x 24"D x 48"L. Ships fully assembled. received it in great condition, have not had time to put it through it's paces to see if it holds up. looks great though!